It's no secret that running isn't always easy. Even the most seasoned runners are plagued with injuries, successful race results , plateaus and a lack of motivation from time to time. Whether you're looking to improve your marathon time or are training for your first 5K, a qualified running coach can not only help you to eliminate these issues, but he/she can tailor an individualized training program that will help you reach your greatest potential as a runner. According to the Furman Institute of Running and Scientific Training (FIRST), a good personal coach can help a runner to "improve one or more of the primary variables of running performance—maximum oxygen consumption, lactate threshold, running economy and running velocity." 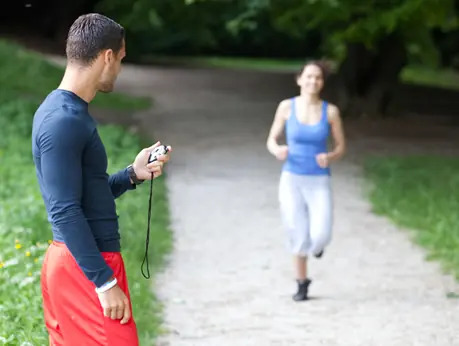 By encouraging you to step up your game in these important areas, a running coach will ensure that you get the most out of each and every workout. With the Internet, there are literally hundreds of coaching resources out there. Unfortunately, not all of them are equal. More: Quiz: Do You Need a Running Coach? The wrong coach can not only be a waste of money, but also do more harm than good. Because anyone can call himself a "coach," it's always a good idea to ask potential coaches for qualifications and/or references. Here are seven resources to help you find a coach who is not only qualified, but also suited to best meet your needs. By clicking on the "Find a Coach" link and selecting your state, you can access a list of certified coaches by city or town. If there are no coaches listed near your area, it might be helpful to contact the closest coach and ask for a recommendation. He/She may know of a great coach near you.